7894 Airport is a City Airport set released in 2006. It contains an airport with a control tower, security check, baggage claim, and a viewers' platform, a baggage truck, an airplane, and five Minifigures. This is the only LEGO airport that includes an aerobridge. 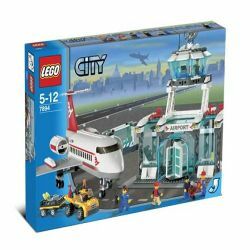 This set was included in the Product Collections sets K7891 City Airport Collection and K7894 City Airport Collection. This the only LEGO airport that includes a turning/working/swiveling baggage claim. This is a description taken from LEGO.com. Please do not modify it. Where will you fly today? It's always a busy day at the LEGO CITY Airport! Load the luggage truck and drive it to baggage claim, then check the plane for any needed repairs and prepare for the next flight. Prepare for security check and help more passengers board the plane. Comes complete with control tower, security check, baggage claim, viewers' platform, airplane and luggage truck! Includes 5 airport personnel Minifigures! Revolving door really spins! Where will you fly today? It's always a busy day at the LEGO CITY Airport! Load the luggage truck and drive it to baggage claim, then check the plane for any needed repairs and prepare for the next flight. Prepare for security check and help more passengers board the plane. Comes complete with control tower, security check, baggage claim, viewers' platform, airplane and luggage truck! Includes 5 airport personnel Minifigures! Revolving door really spins!